Rx Biosciences performs construction and screening of ribosome display libraries. The library of diverse peptide sequences, cDNAs and antibodies are prepared consisting of sites for T7 RNA polymerase, ribosome binding, actinomycin/puromycin binding and RNA stability. After in vitro transcription, translation is performed in vitro using E. coli cell lysates, tRNA, buffer, and high Mg++ at 4oC and the target-ligand-mRNA-ribosome quaternary complexes are selectively isolated and enriched by 3 to 4 rounds of screening. 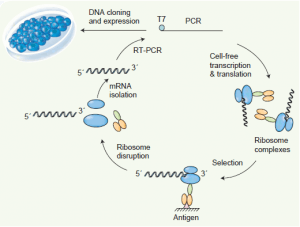 RNA is isolated from the Ligand-target mRNA-ribosome complexes, reverse transcribed and cloned into a vector. The clones are sequenced and translated to identify the amino acid sequence of ligands. The ribosome display allows screening of peptide, protein and antibody libraries with an unparalleled diversity up to 1013-15, enhancing chances of isolating high-affinity binders against a variety of targets.